If you are in a management position, chances are you are going to have to deal with underperforming employees. Addressing poor performance can be difficult or uncomfortable. But there are strategies and techniques to make this an easier and more effective process for you. 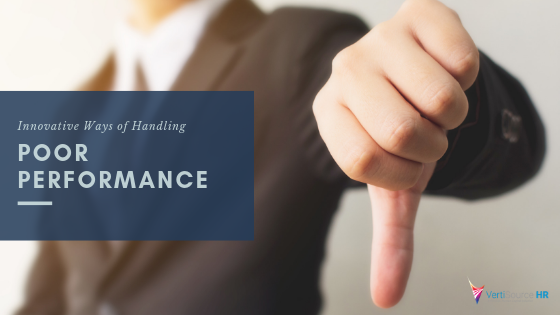 Performance management connects many aspects of a company’s success. When it’s performance management is ineffective, evidence will pop up in everything from employee engagement to company growth. The trick is being able to identify the signs and how they track back to poor performance management. First, let’s talk about what it means to be a poor performing employee so that you can make the correct diagnoses on how to handle this problem. Poor employee performance usually comes from a lack of ability or low motivation. Both of these need to be handled differently so that problems don’t occur later from a misdiagnosis. If the real issue is ability, then increased pressure may only make the problem worse, so keep that in mind. Low individual aptitude, skill, and knowledge. Evidence of strong effort, despite poor performance. Lack of improvement over time. There are a few steps to keep in mind when handling employees with low ability. First, focus on the resources provided to do the job. Do employees have what they need to perform well and meet expectations? Ask them about additional resources they think they need and listen for points of frustration. Also, be sure to verify the claims with your own investigation as people often blame external sources for their poor performance before admitting their own fault. Next, provide additional training. This will also allow you to explore with them whether they have the actual skills required to do what’s expected. Given the pace of change in technology, it’s easy for people’s skills to become outdated. These additional training could be seminars in-house or by external providers, computer-based training, college courses or simulated exercises. These two strategies are extremely effective in curing poor employee performance because people and organizations can get into ruts, and fail to recognize these issues until poor performance finally highlights them. Motivation is the product of desire and commitment. Poor performance in the workplace can come from a lack of motivation altogether. According to Office Vibes, “this can include everything from not getting enough recognition for the hard work they’ve put it, to feeling there are no consequences for doing a subpar job, to burn out after a particularly stressful period.” When this is the case, employers should work closely with the employee to create a more motivating environment in which to work. Goal setting is a well-recognized aspect of performance improvement since employees should understand what’s expected of them and agree on what they need to do to improve. You can help your employee succeed by regularly accessing their ability and take action if it’s deficient. Providing necessary training and securing the resources they need is also a valuable step in innovatively handling poor performance. Also, encouraging cooperation and assistance from co-workers can boost office morale while effective addressing lack of motivation. Remember, your employees most likely just want to leave work at the end of the day feeling as though they have accomplished something of importance or value. It can make all the difference in your workspace to regulate your emotions and address things like poor performance from a position of curiosity, compassion, and empathy. Like our suggestions? Let us know what you would recommend for performance improvement. For more on Employee Engagement, check out Rethinking Employee Engagement: Turning It Around to Achieve Success.